He is reading White Fang, by Jack London. He had the book when he was a kid. He has a resolution this year to read more books and from different genres. When he was a kid, he said he read lots of books but recently hasn't been reading as much. In keeping with his resolution, before this he read Breakfast of Champions, by Kurt Vonnegut and Dharma Bums, by Jack Kerouac. Next up is I'll Be Gone in the Dark: One Woman's Obsessive Search for the Golden State Killer, by Michelle McNamara and Don Quixote, by Miguel de Cervantes. His favorite book is the Count of Monte Cristo, by Alexandre Dumas, which he likes for the build up and long, drawn-out revenge. One good thing, he said, about having a broken washing machine (or was it dryer?) 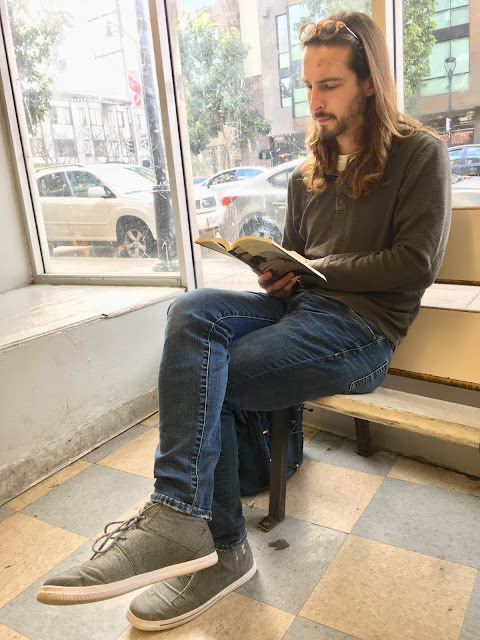 is that sitting in a laundromat is good for reading.